I also tried downloading the version of the SDK that Unreal Engine uses, but that didn't change anything. I managed to get one achievement working, which I can also undo to get again, but as soon as I want to make it so I get another achievement it doesn't work anymore. Is the issue steam integration or achievements? if you open steam (shift tab) how many does it say there are unlocked there? Because my game isn't released yet I can't access that page, but the ones that don't unlock do not show as unlocked most recent. No, if I only do the ones that don't unlock nothing happens, they succeed but don't show up as unlocked. If you shift tab you can also see the number of achievements unlocked (e.g. 10/16 achievements). Could you confirm this is at 0 when you try to unlock them? If so, I have no idea what is wrong. I've spent some time testing this using the default 480 app ID and its achievements and it seems to be working as expected. What steps can we take to reproduce the issue on our end? Could you please provide the logs from your project's Saved->Logs folder after testing this so I can see if there are any hints in there? The default app ID works fine for me as well, so that is weird. I have been able to reproduce it in a clean project. I have to send you my .ini file, I rather not have it public. What happens if you just write one achievement per key press instead of attempting to write all of them in one function? 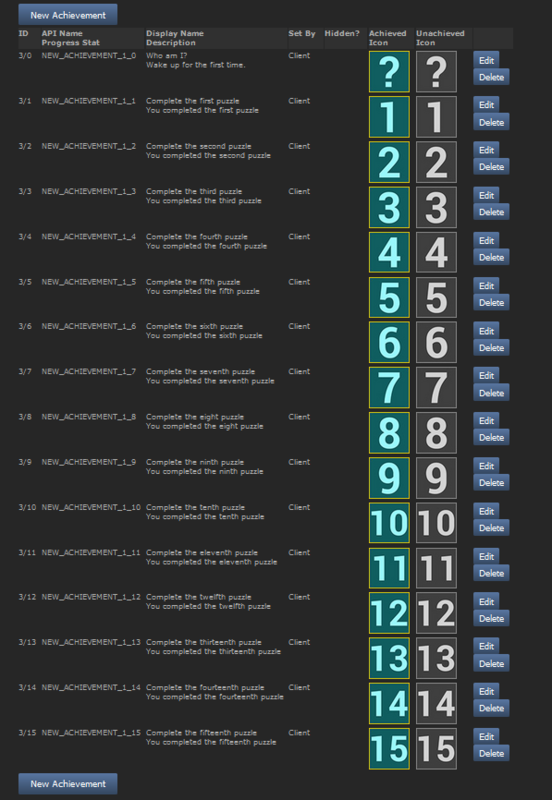 I have a feeling that the issue could lie in attempting to unlock multiple achievements at once. Try splitting this up into a few different key presses and see if you still experience the same error. I did not forget to publish the changes to Steam. The achievement blueprints are in the characterbp. I've attempted to test this using the project you provided, but I'm not seeing any achievements get granted. All I see is the message being printed to the screen, and this is working regardless of which achievement ID I use. 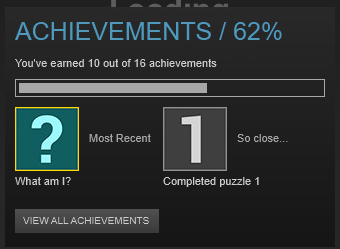 However, I never actually get the Steam popup that shows an achievement is unlocked. Is this expected? Is there something I may be overlooking when testing this? The message should only print to the screen if the achievement registers, which it doesn't. In my tests, the message was printed to the screen regardless of which achievement I used. Is this the expected behavior? It seems like they're successfully getting written based on the fact that they are printing the achievement name to the screen. However, since the steam overlay is not appearing I'm unable to see if they are actually being unlocked or not. Is this expected in your project as well? Are you seeing the overlay on your end? I am seeing the overlay on my end. But indeed, regardless of whether or not an achievement registers to Steam, the true pin fires. Funny how it slipt through our eyes, glad you found it. I'd be glad to take another look. However, without a local repro after additional testing and with regards to me being unable to reproduce it in your project, I'm unable to take further action at this time. Feel free to leave a comment to reopen the thread with the requested information. Please do not mark a question answered when it is clearly not. I have already told you the steps to reproduce it, multiple times even. In order for the overlay to work you need to run Steam as administrator and Unreal Engine 4 as well, then play it as a standalone game. And I've followed those exact steps with no results on my end. All of my other Steam projects function as expected using the same workflow. The achievements that you state are working are not working on my end, and as a result I'm unable to test using the project you've provided. As stated, any other project I create works fine with Steam integration, I only run into issues when using the one you provided. We do not currently have the resources available to allocate to debugging the project, and without a local repro on our end in a clean project, we are unable to take any further action at this time. Based on the behavior you've explained, I have to assume that the achievements are working correctly, as some of them are being credited. It's also possible that there is an issue on the Steam side of things. Have you tried getting in touch with their support to see if this could be something related to Steamworks? As stated earlier, if you can provide me with a project using the 480 test app id that showcases the same issue, I'd be glad to take another look, but due to the lack of a local repro, we're limited as far as what action we can take at this time. If I do it with the 480 test app it works fine, it only doesn't work with my game. I have tried getting in contact with Valve but they have completely ignored me and they don't have a contact email for this stuff. Without being able to reproduce this on my end, it leads me to believe that there could be an issue with your specific setup, or there is a Steam issue that will need to be resolved by Valve. If after getting in touch with Valve it is deemed to be an issue with Unreal, feel free to leave a comment to reopen this thread. However, at the current time, we do not believe that this is a bug with the Unreal Engine. I would like to keep this question open until a solution has been found. Unfortunately, that's not the process. Marking a topic as resolved is strictly for tracking purposes, and you are always welcome to reopen a thread with a comment when new information is to be provided. Oke, will do, thanks for the help. hey, did this get resolved? im having the same issue where the ap480 achievements work, but when i use my own games app id, the achievements don't work. So I ran into the same issue at first but was able to get my achievements working. The problem is that you cannot achieve achievements until you've made them public for your game. So after creating the achievements with your Steam Partner account, you have to hit the PUBLISH button and make them publicly available. This makes sense because you're logging into the game via your own steam account and if they're not available to the public then even you can't see them. That's why there's a testing branch, to make sure your code is working. So use the 480 app id for your testing and then when you want to see your own achievements, make them public via the publish button on Steam.